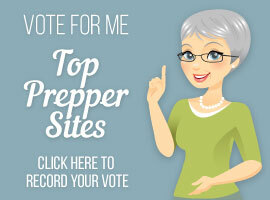 Are you ready to learn about the 12 vegetable seeds you should plant in April? Oh my gosh, I can hardly wait to get my hands in the earth. Mark and I picked up some organic soil and worm castings to add to my grow boxes in the backyard. The first thing we need to do is pull any weeds that have come up since the last time you turned over the soil. 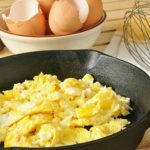 Dig out any leftover crops that you may have missed the last time you harvested. Turn the soil several times and add the following amendments, if you need them. You may remember, I have raised garden beds because I don’t want to bend down as far to work in my garden anymore. I’m adding two more raised beds this year, I feel an urgency to raise more food for my family. What Does The Term Harden Off Mean? This is when you have already planted the seeds, and they have germinated, sprouted, and you have thinned out the sprouts you do not want. Now you need to get the plants ready to transplant outside without any issues. “Hardening off” means you are slowly taking the seedlings outside a few hours each day to get them used to sunlight, the dry air, and cold nights. This is one vegetable you need to realize takes 2 to 3 years for the asparagus plants to get started and produce. It’s totally worth the wait, I promise. These are a perennial, meaning they will come back year after year once they get established. The plants will grow year after year, sometimes even up to 30 years. You need to decide how much your family likes asparagus. We purchased 20 plants which is 10 for each of us. It’s all about how much you want to produce. My suggestion is a minimum of ten plants per person in the household. Once it gets established you will have asparagus for life. You can eat it raw, cooked, and even freeze it. 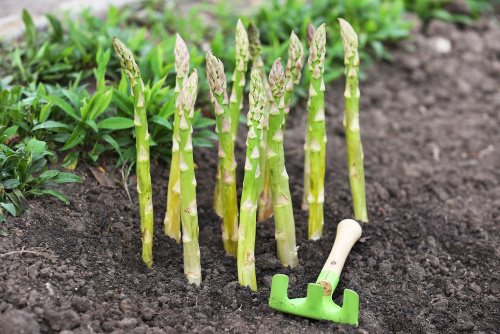 Asparagus likes a cool winter to go dormant and grow strong for spring. You will have better luck if you have colder winters over mild winters. It makes the stocks get stronger. They like well-drained soil with a lot of organic matter. Plant the plants two inches deeper than the original growth mark. Plant them at least 6-8 inches deep running the length of the row. Space the plants 12- to 18 inches apart. After planting them be sure and water the soil around them. Keep fertilizing them with Miracle Grow All Purpose liquid or granules as they grow. Plant the seeds 1/2 inch deep and 12 inches apart. The seeds will germinate in about 5-10 days and they need the soil temperature to be 65-85 degrees. Plant the seeds in full sun to get the best harvest. Once the plants reach six-inches tall start cutting them back so they will branch out and have stronger stems. They need soil that drains well. Fertilize them with Miracle Grow All Purpose Liquid or granules and water it in. Water often, but don’t over-water. 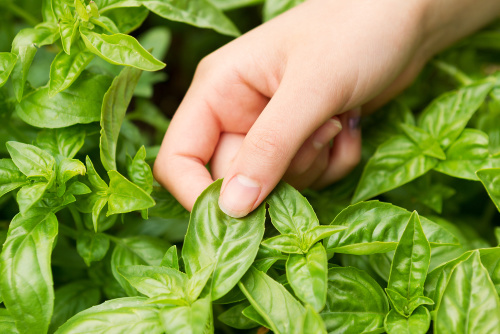 Some people like to plant different varieties of Basil together. Once you see those white flowers cut back the basil big time. It will come back, I promise if, the weather is still good. 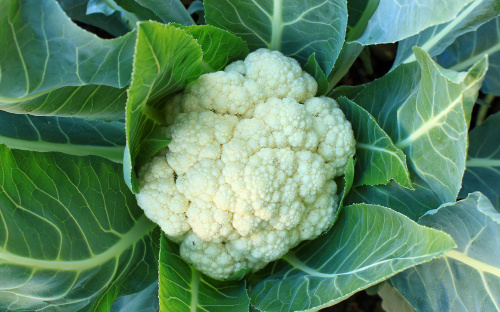 Cauliflower is a cool season crop, however, it’s a bit more temperamental than broccoli. The trick is having cool temps consistently in order to produce crops with larger heads like grown in coastal neighborhoods. Cauliflower likes temps around 60 degrees, if the temperatures get too hot or too cold, it stresses the plants and produces tiny buds. 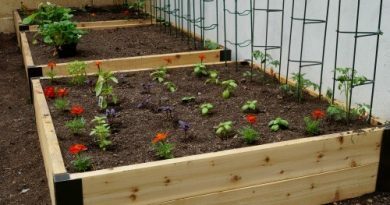 Plant the seeds about 18 inches apart with rows 30 inches wide. Cover the seeds with soil and compost. Water in the seeds gently. When the cauliflower heads are about two inches in diameter, cover them with their own leaves, if possible, to shade and protect them. Ideally the head will grow to 6-7 inches in diameter. 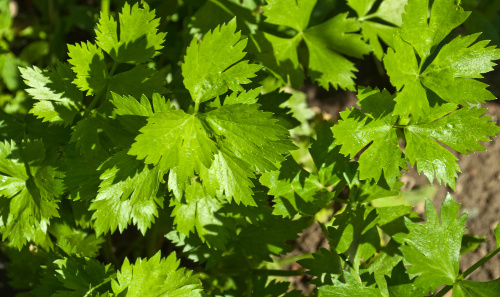 Celery seeds are so tiny you may want to mix them with sand before sprinkling them over the loamy, well drained soil described above with nutrients added. The temperatures need to be at least 50 degrees F. (10 C) before you plant the seeds. Cover the seeds with a little bit of soil and sprinkle the seeds with water. They like to be planted shallowly. Once you see some sprouts you will want to thin them. 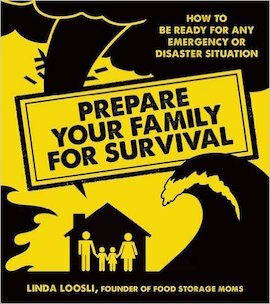 They will not tolerate a drought at all. They need a lot of water, so keep that in mind when deciding where you plant them. Please fertilize regularly to have the best harvest. Start the seeds indoors about 4-6 weeks before you transplant them outside. Plant the seeds 1/4 inch deep in Organic seed potting soil. 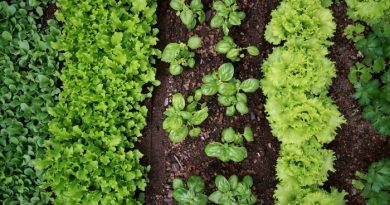 Prepare the soil outside to transplant the seedlings with a 5-10-5 fertilizer spread with 1-inch of well-rotted manure. Transplant the seedlings when they are 3-4-inches tall and space them 24-30 inches apart in the garden beds that you have prepared for them. Cover the base of the seedlings with a good mulch to protect the plants. Stake the plants right away because the eggplants get heavy very quickly. I have used tomato cages that work great, but mine are heavy duty and will not tip over. After planting, water well. Fertilize every two weeks. Watch for the number of eggplants growing. Thin the eggplants to five or six per plant to have the best harvest. 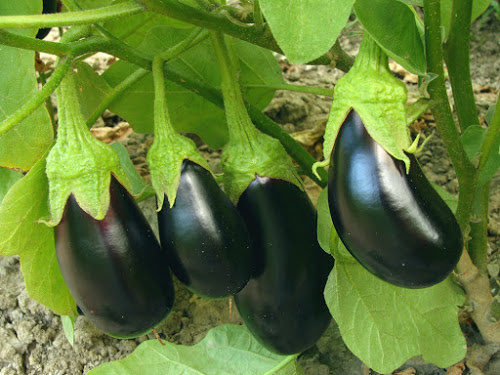 Eggplants take 100-120 days to reach maturity from seed to plant. Eggplants prefer warm weather over cool weather. They prefer the soil to be 70-90 degrees F. to germinate. They need one-inch of water per week. 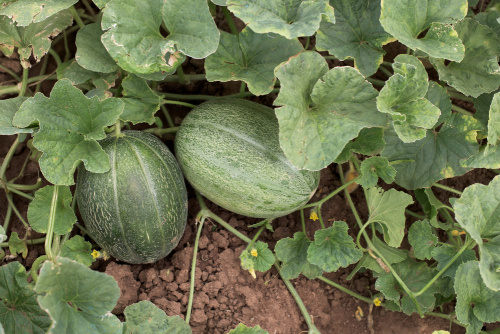 Melons are actually really easy to grow if you have three things. Sunshine, warm weather and amended soil with well-rotted manure and organic compost. The soil temperature has to be above 70 degrees in order to germinate the seeds. I typically plant three seeds in each hole about 1-inch deep and space them 36-inches apart to allow for growth. Once the seeds grow to 3-4-inches, I choose between the three seeds that sprouted and discard the weakest of the three leaving two standing sprouts. 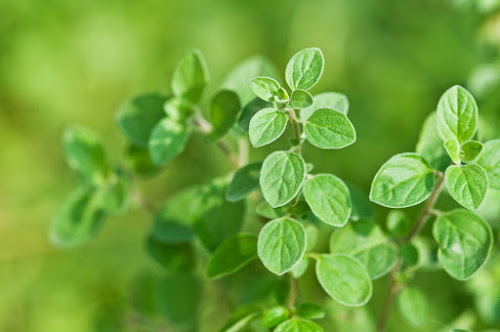 You can grow Oregano in the ground or in pots. It’s actually a perennial, so it will come back year after year. You need to keep it under control because it will take over the garden, so cut it back as needed. It’s stronger in flavor once dried compared to when it’s freshly picked. Sow your seeds indoors about 4-6 weeks before you plant the seedlings outside. Use a good potting soil and cover the seeds with a little soil. They will germinate very quickly. Make sure the soil has a temperature of 70 degrees before transplanting them outside. Plant the seedlings at least eight to ten inches apart. 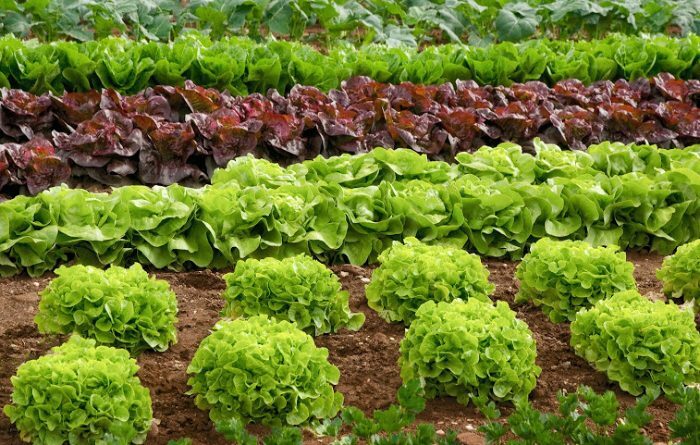 They will actually grow very well in light soil and with very little fertilizer. 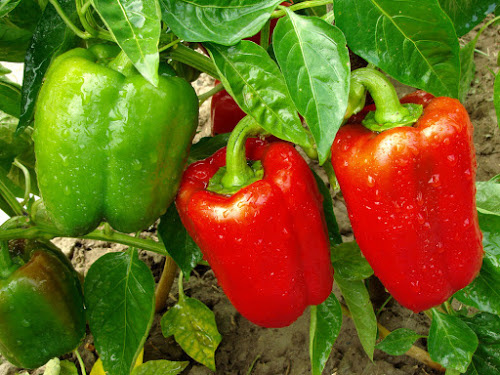 They do well growing around tomatoes and peppers as companion plants. Water only when the soil is dry to the touch. I let mine grow to eight inches tall and harvest the leaves before they flower. The leaves dehydrate very well. Rosemary is a great herb to grow, but it’s a bit more challenging to grow from seeds compared to other herbs. Rosemary seeds are best started indoors and transplanted as a seedling. Plant several seeds in one container with potting soil because they may not all germinate. 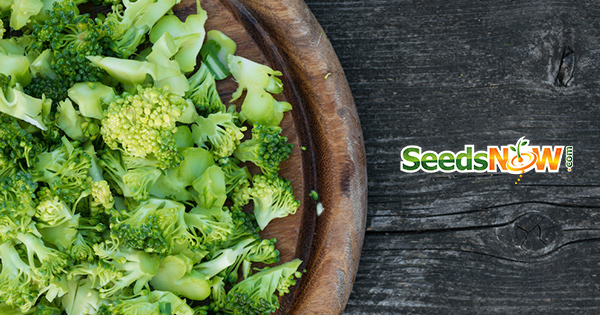 Cover the seeds with a thin layer of soil and gently water the seeds. Thin the seeds if needed once they start to sprout. Do not overwater. Rosemary does not like a lot of water. The soil has to be warm outside in order to transplant the seedlings. The soil must be 80-90 degrees F before you can move them outdoors. It’s a woody perennial that won’t be ready for harvesting the first year. Some people buy the plants at their local nursery because they are harder to get started from seeds. Where I live in Southern Utah it takes over the yard. 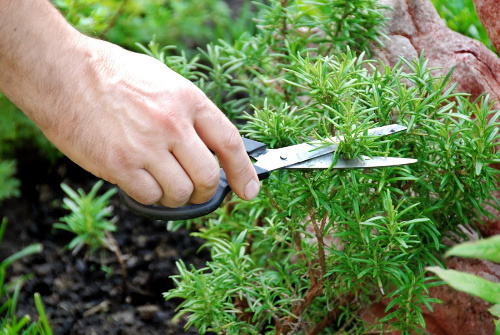 You have to really keep cutting back or you will have a shrub three feet or more in diameter. 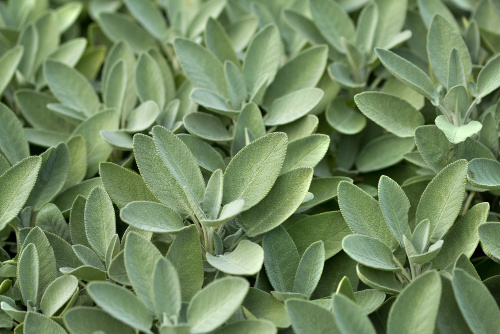 Sage will thrive in sandy, loamy, and well-drained soil. 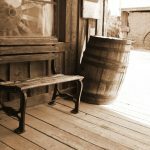 You do not have to fertilize Sage very often, it’s a pretty easy herb to grow without a lot of fuss. Plant the seeds in a good potting soil and transplant to a location with full sun and well-drained soil. You can transplant the seedlings when the soil temperature is 60-70 degrees F. Plants will grow from 12 inches to 30 inches in height. 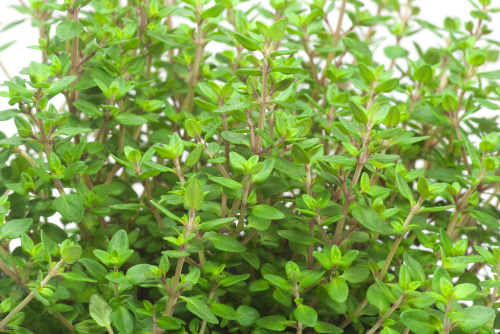 Thyme is a perennial shrub with light branches and small purple-pink flowers. It’s a little harder to grow Thyme from seeds, but not impossible. You have to be patient to get the seeds to germinate, so plant more seeds than you expect to transplant outside. You need to plant the seeds indoors 8-10 weeks before the last spring frost in well-drained soil. The soil needs to be 70 degrees F before transplanting the seedlings. The plants will grow from 6-12 inches in height. Abraham Lincoln: 1 lb. heirloom, great for ketchup and tomato juice. Easy to grow and matures in 85 days. Beefsteak: large tomatoes over 2 lbs. easy to grow, great for slicers and matures in 85 days. Bonnie’s Best: 6-8 ounce fruit, great for slicers or canning. Matures in 85 days. Marion: chefs prefer these crack resistant tomatoes. Great for salads or sandwiches. Matures in 75 days. Pear: pear-shaped fruits that grow in clusters. Great for salads. Matures in 75 days. Homestead: a popular heirloom variety. Good one for canning and they are great in a hot climate. They mature in 80 days. Mortgage Lifter: they produce large tomatoes, up to 2 lbs. Easy to grow and matures in 70 days. 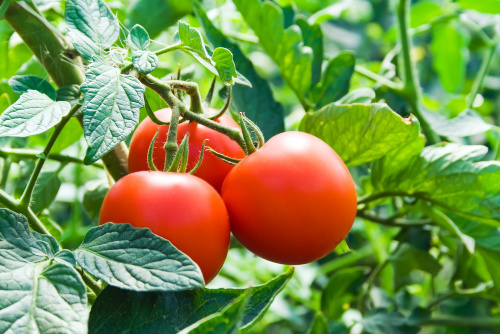 Money Maker: it’s one of the most reliable tomatoes you can grow. They grow up to 8-ounce size tomatoes. They are easy to grow and mature in 85 days. The seedlings need the temperatures to be 70 degrees F during the day and 40 degrees F at night. Once the seedlings reach 4 inches tall transplant them into larger containers. Please plant them deeper than other vegetables. I had to make an age related tease. You included sage, rosemary and thyme but not parsley. Simon & Garfunkel would be so utterly disappointed. LOL!!! I just ordered 3 hydroponic planters for my deck. I am going to grow herbs, salad makings and possibly tomatoes. These pots come from Grow Box and they are guaranteed for one year but the website says they will last indefinitely! We’ll see! Since I don’t have garden space available, I thought these would suit me well. I purchased the 3 planter special and they come with nutrients, not soil or plants which I will get locally. I am not going to start plants from seed, however, as I just don’t have the space to do so. 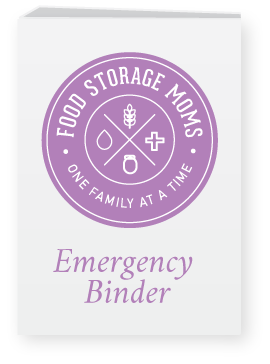 I do have a great nursery locally and the Farmer’s Market for starts. I am looking forward to making my salads from my own grown lettuce/radishes/herbs. 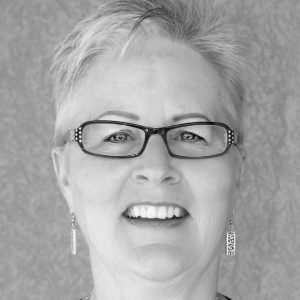 Linda, thank you for all the encouragement to us to get in the garden and grow things!!! I love being in the garden with my hands in the soil, enjoying the fresh sunshine and cool breeze on my face. I am starting to harvest peas now, I want to especially thank you for the recommendation of SeedsNow. I love the fact that you can buy small packets of seeds since I have a very small space for my containers and raised beds. The germination rate is good and quality seems to be right up there. 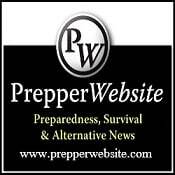 Also good resources on the website about growing various kinds of veggies.